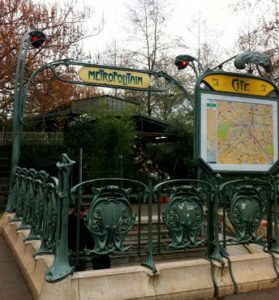 Today, when thinking about Paris, I was reminded of how fantastic, efficient and affordable the Metro is. There are 14 color-coded lines (although, you need to know the name of the last stop on the line to know which direction to go (i.e., line 1 heads to Nation in the west and Chateau du Vincennes in the east), has more than 300 stations, and is never more than a couple of blocks away, no matter where you are in the city. I love just about everything about it — except those stairs in some of the Metro stations. Oy vey! This entry was posted in Metro and tagged Arts et Metiers, Cite, Metro, Palais Royal-Musee du Louvre, Sentier by Bob Adams. Bookmark the permalink.